The Halloween-costumed Buckeye wears the colors of fall in New England. It has been lingering into November in recent years, as well as arriving earlier. Its annual immigration into our area, beginning at least by July but sometimes earlier, has been known from at least the mid-19th century. Thaddeus W. Harris was the first to report this species in Massachusetts; he found one in a meadow in Milton on August 19, 1827; it is still preserved in the Harris Collection at the Harvard MCZ (Harris 1862: 293; Index). Frank H. Sprague wrote in 1878 that he had taken "a number of specimens" in the last three years in the Wollaston (now Quincy) area; in fact, he took 7 specimens there in 1876, 1877 and 1878, as well as one in Granby in western Massachusetts in August 1878 (Sprague 1879a, 1879b; MCZ specimens). Samuel Scudder’s list of towns where the Common Buckeye had been collected by 1889 belies his characterization of it as “exceedingly rare in New England." In addition to Harris' and Sprague's sites, Scudder lists at least eleven other locations in Massachusetts where this species had been found, including Springfield, Amherst, Boston, Malden, Jamaica Plain, Natick, Weston, Newton, Taunton, Cape Cod, and "western Massachusetts." All were seen between July and September. Prof. H. W. Parker took one and saw others on roads in Amherst in 1874, and A. H. Clark found it in Newtonville in 1895 or 1896 (Scudder 1889: 499; Parker 1874; Clark 1913). The Denton Brothers captured at least one in Wellesley in 1896 (MCZ Denton mount collection). This supposed “rarity” was actually quite frequently reported in the early literature, probably because it was an interesting butterfly to collectors. A "novelty," as Parker put it (Parker 1874). By the mid-1930’s Farquhar lists more locations where Common Buckeye had been found: Sharon, West Roxbury, Cohasset, West Gloucester, Rowley, Cambridge, Essex, and Woods Hole. Root adds North Andover in 1945 (Farquhar 1934; Clark 1925; Root and Farquhar 1948). There was a large flight of Common Buckeye into southeastern Massachusetts in the fall of 1945, when “over 100 at once” were reported along the coast (Cassie, MAS Atlas). That year W. P. Rogers collected four specimens at Westport in September, and two more in October. He also found one at Westport in October 1939 (Yale Peabody Museum). Vladimir Nabokov and his son Dmitri collected two in Wellesley in July and August 1945 (MCZ). C. P. Kimball reported it as "rare" on Nantucket in the 1930's; however there are four historic specimens (n.d.) in the Maria Mitchell Museum today (pers. comm. and photos, 9/2011, E. LoPresti). F. M. Jones found it "usually present in the late season" on Martha's Vineyard. Mid-July was the earliest it arrived on the islands (Jones and Kimball 1943). Jones' specimen from August 21, 1945 is in the Yale Peabody Museum. Both historically and today, Common Buckeye is a regular summer and fall immigrant into Massachusetts, but it cannot survive winters here so far as is known. It re-populates southern New England each year from larger populations further south, and is able to produce one or more generations here, depending on the date of arrival. Warm springs allow earlier arrivals. The numbers arriving each year are variable; 1990 and 1994 were relatively large flight years, with the species arriving in June (Cassie, MAS Atlas). In broods emerging in the fall, the under hind wing is rose-colored (extreme is form "rosa") rather than tan; rose-colored fall individuals have been photographed in Massachusetts, for example by Barbara Spencer in Cummington on August 23, 2004: http://www.pbase.com/barbaraspencer/image/138410202 . Common Buckeye ranges quite far south in the Americas, to southern Mexico, Cuba and the Bahamas, and uses different host plants in different regions. Most host plants are in the Scrophulariaceae (snapdragon) or Plantaginaceae (plantain) families. In New England and the mid-Atlantic, the most common host plant for the summer brood in the nineteenth century was probably purple gerardia (Agalinus purpurea). Scudder wrote “The favorite food of the caterpillar appears to be Gerardia purpurea Linn. one of the Scrophulariaceae....(1889: 500).” In 1893 Mrs. William Starr Dana wrote in her popular book How to Know the Wildflowers that in late summer purple gerardia flowers brightened “the low-lying ground along the coast and in the neighborhood of the Great Lakes. The sandy fields of New England and Long Island are oftentimes a vivid mass of color owing to their delicate blossoms.” And the little seaside gerardia, G. maritime, enlivened the salt marshes (1989 edition: 200). Today, lacking such an abundance of gerardia, Common Buckeye’s most usual host plant in Massachusetts may be Plantago lanceolata, or lance-leaved plantain, a widespread non-native weed introduced with the arrival of European settlers. The 1990-95 Connecticut Atlas workers observed Buckeye ovipositing on lance-leaved plantain in the wild, and the caterpillars have been successfully raised on it many times, for example by caterpillar photographer Sam Jaffe in July 2011. Buckeyes have been observed in the wild ovipositing on the native purslane speedwell (Veronica peregrina) (S. Jaffe 6/21/2011), and on the non-native butter-and-eggs (Linaria vulgaris) (M. Champagne 7/14/2008). They are also reported to use blue toadflax (Linaria canadensis), slender gerardia (Agalinis tenuifolia), and sometimes non-native garden snapdragons (Antirrhinum majus) (Scott 1986). Common Buckeye thus uses both native and introduced plants. It is listed among the Switchers (Table 3), having added the non-native hosts such as plantain to its original native hosts. Common Buckeye’s preferred habitat is open areas at lower elevations, with some bare soil. It is frequently found basking in patches of bare soil, such as dirt roads, sandy beaches, and clearings under power lines. Its host plants, however, often prefer moist to average soil, so that the complete habitat is a combination of open vegetated areas and areas of bare soil. 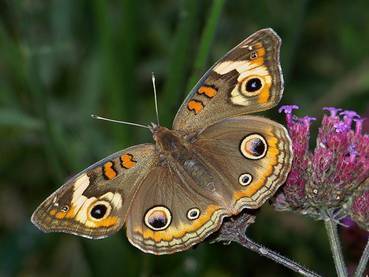 Common Buckeye adapts to disturbed areas, and can be found breeding in weedy vacant lots and edges of plowed fields. The land clearing at the start of agricultural development 1600-1850 in New England undoubtedly increased habitat for Common Buckeye, as it did for many other butterflies (Table 1). But as with our other seasonal immigrant species, overall abundance in this region depends on climate and other factors in the southern part of its range, as well as here. Common Buckeye ranks as an “Uncommon-to-Common” butterfly in the state, according to 2000-2007 MBC records (Table 5). The 1986-90 MAS Atlas also ranked it as uncommon-to-common, so there was not a major change in status over those 15 or so years. Chart 58 shows no obvious trend toward increase or decrease in the numbers of Common Buckeyes seen per number of trip reports 1993-2009. Nor did a list-length study of the same MBC data find any strong pattern of change 1992-2010 for this species (Breed et al. 2012). But there is a marked pattern of alternate year fluctuation, with a good flight year usually being followed by a poor flight year, which is then followed by another good flight year. In good flight years, Buckeyes are usually seen early in the season, in June or even May or April. 2009, for example, was a poor arrival year, the first Buckeye not being seen until 7/12/2009 on the Blackstone Valley NABA Count. In contrast, 2010 was a year of numerous Buckeye sightings, with the first one reported on 5/13 (Foxboro, M. Champagne). 2011 and 2012 continued the upward trend of sightings, with the first arrivals coming as early as 4/29/2011 and 4/21/2012 (see below). Many new sighting locations across the state were added in those two years, and fresh individuals were reported, especially in plantain fields, into September. But then 2013 was a poor year for Buckeye sightings. The year 2000 appears to have been exceptionally good for Common Buckeye sightings, but the reading shown on Chart 58 may be somewhat misleading. The Westport/South Dartmouth area on the coast is one of the few locations where Buckeyes are reliably seen in fall in double-digit numbers. In 2000 multiple visits were made to this area by many different observers, as part of a migration study, and all observers submitted large counts of Common Buckeyes, and there may have been some duplicate counting. In preceding and subsequent years there were many fewer trips to this area. 2000 was an abundant flight year for this species, but perhaps less unusual than Chart 58 would suggest. Between 1993 and 2013, Common Buckeye was reported from 125 of the 315 towns in Massachusetts (Map 58). Twenty-eight new towns were added in 2010-2013 alone. Sightings are distributed across the entire state, including Cape Cod, Martha's Vineyard and Nantucket, but they are rather scarce west of the Connecticut River valley. In this area, many of the sightings shown were added only in the recent banner years of 2011 and 2012 (e.g. Lenox, Sheffield, Cheshire and Williamstown). Compared to the 1986-90 MAS Atlas map, the BOM-MBC map shows many more reports from Franklin County, northern Worcester County, and the Connecticut River valley. Having more observers in the field for a longer time is probably the reason, but there may also have been a real increase in the numbers of Common Buckeyes in those areas. Common Buckeye is less often found at higher elevations, and has only occasionally been reported from the long-running Northern Berkshire (since 1993), Central Berkshire (since 1987), and Central Franklin (since 1990) NABA Counts. It had never been reported on the Southern Berkshire (since 1993) NABA Count until 2011. There was a marked increase in reports from Berkshire and Franklin Counties in 2010 and 2011 (good years overall for Buckeye in the state). In 2011 the Central Franklin Count had 5 on 7/4/2011, the highest number ever for that count, and singles were found on the Northern Berkshire Count 7/9/2011, the Central Berkshire Count 7/16/2011, and the Southern Berkshire Count 7/8/2011. F. Model reported a Buckeye from Lenox (Berkshire Co.) on the early date of 5/12/2011. And in high-elevation Williamstown (northwest Berkshire Co.), 4 Buckeyes were reported from two different locations in 2011. Local reporter Pam Weatherbee said it was the “first time I’ve seen it here” (masslep 7/13/2011). Although Common Buckeye was historically reported as "rare" on Nantucket (see above), it may be becoming less so. In BOM-MBC records are sight reports of 2 in 2006 S. Perkins; 7 in 2011 E. Haugh; 2 in 2011 E. LoPresti; 1 in 2012 V. Laux (photo); and 3 in 2013 M. Pelikan. Some believe it may overwinter (LoPresti 2011). The Martha's Vineyard checklist ranks Common Buckeye as "common in late summer" (Pelikan 2002), and there are many BOM-MBC records. Westport Gooseberry Neck 51 on 9/18/2000 B. Cassie, 10 on 9/1/2012 F. Model; Dartmouth Allens Pond 20 on 9/10/2011 L. Miller-Donnelly et al; Longmeadow Fannie Stebbins WS 17 on 8/7/1999 T. Gagnon; Westport Horseneck Beach 15 on 9/23/2000 B. Bowker; Easton/Sharon Borderland SP 12 on 8/10/2004 B. Cassie; Northampton West Meadows 12 on 9/26/2004 T. Gagnon; Edgartown Katama Plains 11 on 10/11/2010 M. Pelikan; Newbury Old Town Hill TTOR 7 on 8/18/2012 M. Arey; Easthampton Arcadia WS 7 on 9/24/2006 T. Gagnon; Wenham Wenham Canal 7 on 8/23/1999 A. Robb/T. Hansen/F. Goodwin; Woburn Horn Pond Mountain 7 on 6/19/2011 H. Hoople; Oxford Buffumville Dam 6 on 9/12/2004 B. Walker; Chilmark Squibnocket 5 on 9/5/2002 A. Keith; Rockport Waring Field 5 on 9/21/2002 MBC members; Pittsfield Canoe Meadows WS 5 on 7/25/1999 T. Tyning; Grafton Dauphinaise Park 4 on 6/20/2011 D. Price and M. St. Onge; Hingham Worlds End TTOR 3 on 7/10/2008 B. Bowker; Hubbardston/Rutland Barre Falls Dam SP 3 on 6/27/2004 M. Lynch and S. Carroll; Westborough Heirloom Harvest CSA, 2 on 9/12/2012 S. Arena ; Chelmsford power line 9 on 5/19/2012, B. Bowker; Plymouth, 4 at Eel R. Headwaters and Tidmarsh Farm 6/30/2012, S. Stichter et al. ; Dunstable Arched Bridge, 4 on 6/21/2011, J. Forbes; New Bedford Plainville Rd. 11 on 7/23/2011 M. Mello; Duxbury Bay Farm 4 on 8/19/2011, B. Bowker; Northampton community gardens 10 on 8/29/2011, F. Model; Ipswich Appleton Farms 10 on 9/4/2011, R. Hopping; Nantucket 7 on 10/24/2011, E. Haugh. Gosnold Penikese Island 3 on10/15/1999, T. Hendrickson; Chatham South Monomoy 1 on 9/4/2005 B. Nikula; Boston Spectacle Island 1 on 10/2/2008, T. and C. Dodd; and Nahant 1 on 10/5/2008 L. Pivacek. Common Buckeye may sometimes form sedentary breeding colonies for the summer, although these are ultimately transient and may not re-occur at the same site the next season (NaturServe 7/2011). In the 1986-90 Atlas, B. Cassie reports two “breeding colonies” seen in 1990, 80 in Falmouth (n.d.) and 21 in Westford (9/4/1990). No such large late summer colonies have been reported since then, but they may not have been looked for or recognised. Common Buckeye was seen in Massachusetts from mid-June through early November, according to 1992-2007 MBC records, with a very few sightings being reported in May (and now April) (http://www.naba.org/chapters/nabambc/flight-dates-chart.asp). The earlier sightings are all presumably new arrivals, since the species has not been shown to over-winter here, even on the southern islands. However, females have been observed laying eggs, and at least one generation probably matures in Massachusetts. The Common Buckeye life cycle takes about 25 to 45 days from egg to adult, so an early June arrival would allow for two generations. The largest number of individuals reported is in September. Late fall (September-October) sightings are most numerous at coastal locations, since Common Buckeyes normally undertake a return migration south. Earliest sightings: In the 21 years of BOM-MBC records 1993-2013, the four earliest "first sightings" are 4/21/2012 Medford Middlesex Fells, M. Arey; 4/29/2011, Chicopee Westover Air Base, S. Stichter et al. ; 5/13/2010 Foxboro, M. Champagne; and 5/16/2000 Wenham, F. Goodwin. The three earliest sightings have been in the last three years. The very warm springs in the northeast in 2010 and 2012, along with a particularly warm day in a southern location in 2011, provide at least some of the explanation. Further analysis is needed, but there may be a trend toward earlier sightings of this species. Other than these four early years, there were eight years in which the earliest sighting was in June, and nine years in which it was July or later. In all these years there were many skilled observers in the field beginning in spring, but Common Buckeye was not seen. It seems safe to conclude that there were some years in which Common Buckeye did not make it to Massachusetts until very late in the season, and other years in which at least a few were quite early. Scudder, who synthesized what was known about butterflies in our area in the 19th century, wrote that the “earliest recorded capture” in New England was July 18 (1899: 501). The numerous June and early July sightings today strongly suggest that the species is arriving here earlier than it did in the late 1800’s. The earlier arrival would make two broods possible, whereas in the 19th century there was probably only one. Scudder wrote that since there were no signs whatever of a spring brood in New England, it was most probable that all the July and early August specimens were immigrants from further south, and that the September brood was the only one born in New England, except possibly in the southernmost locations (1899: 501). Latest sightings: In the same 21-year time period, the four latest "last sightings" in BOM-MBC records are 11/10/2012 Fairhaven, M. Lynch and S. Carroll; 11/7/2008 Edgartown Katama Plains, M. Pelikan; 11/6/2004 Chilmark, A. Keith; and 11/4/2000 Edgartown Katama Plains, M. Pelikan. Almost all of the late and last sightings occur on Martha’s Vineyard or along the southern coast , for example at Westport/south Dartmouth (Gooseberry Neck). In 19 of the 21 years 1993-2013, the last sightings of Buckeyes have been in October or November, rather than September. Scudder makes no mention of any October or November sightings or specimens, suggesting that the Common Buckeye may be staying longer in New England than it did a century ago. In the mid-1980’s, it was accepted that Common Buckeye survived the winter only as far north as the coastal dunes of North Carolina (Opler and Krizek 1984: 162). While its range of full-time residency might be expected to move north somewhat in response to global climate warming, there is still no evidence that it over-winters in either the mid-Atlantic or New England states. However, the numbers emigrating northward, and the number and success of the generations raised in New England, may be expected to increase with climate warming (Table 6). Preservation of open, rural habitat will benefit this species, which will make use of farm fields and waste areas, as well as less disturbed habitat. Common Buckeye’s conservation status is S5 or Secure throughout most of its range (NatureServe 7/2011). Unless there is major habitat loss further south, numbers of Common Buckeyes in New England, and their length of time here, may be expected to increase in coming years.